SCOE has long been a leader in the maker education movement, helping to start a Maker Educator Certificate program for teachers at Sonoma State University, hiring its own, full-time Curriculum Coordinator for Maker Education, and building a Design Lab where local teachers can learn the basics and become acquainted with tools like laser cutters, 3D printers, and more. This year, that leadership position continues to grow, with SCOE hosting its second annual national conference on maker education, presenting at the NASA Langley Research Center, and joining the ranks of 15 maker education hubs around the country. SCOE's make and science coordinators, Casey Shea and Anna Van Dordrecht, have been invited to the centennial anniversary of NASA's Langley Research Center in Hampton, VA to provide maker education information and activities. The event should be an excellent opportunity for public outreach and engagement around maker education and STEM activities: more than 10,000 people are expected! SCOE's work around maker education has clearly made an impact on Walt Engelund, Director of Space Technology and Exploration Directorate at Langley. "After working with Casey and seeing what he and Anna are doing with the hands-on learning and maker themed activities, I am convinced this type of learning is an essential element to engage and prepare a diverse pool of our youth for STEM related careers at NASA and beyond. I sincerely hope that we can continue to collaborate and find ways to promote these efforts and catalyze the STEM education movement," he wrote in a letter to County Superintendent Steve Herrington. This year, SCOE has been selected as one of 15 regional hubs for Making Spaces: Expanding Making in Schools Across the Nation. This two-year program is a partnership between Google, the Maker Education Initiative, and the Children’s Museum of Pittsburgh. It includes grant funding for SCOE as well as six to ten local schools/districts it chooses to partner with. 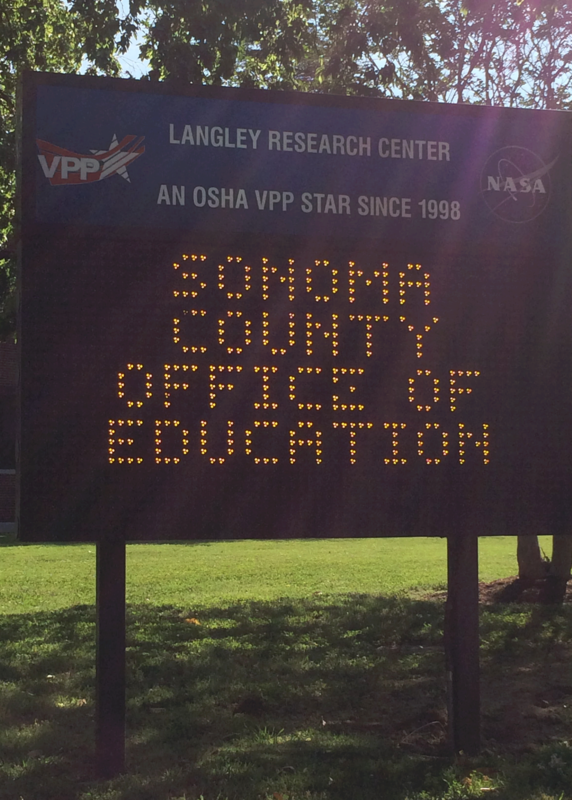 Accepted schools will partner with the Sonoma County Office of Education to create a sustainable vision for integrating making as a learning process into school-based efforts.This might include the incorporation of making into classroom instruction and learning, the development of a dedicated makerspace at the school, the creation of an after-school program, or a professional development program for teachers and staff. Schools will then work with SCOE to create and successfully launch a crowdfunding campaign in order to raise awareness and funding and put the plan into action. From exploring the ocean with a virtual reality headset to creating a working guitar from cardboard, about 250 educators from around California and far beyond attended SCOE's second reMAKE Education Summit on August 2 - 4. The event was co-sponsored by Google Making & Science and included presenters from Pixar Animation, NASA, EdSurge, and more. The goal? To learn how hands-on making activities can transform their classrooms and instill a passion for learning in their students. The one-of-a-kind conference took place in a large community makerspace in Santa Rosa, 180 Studios, and was designed to meet the diverse needs of all kinds of educators through dynamic presentations, interactive activities, and lots of making. One hundred percent of attendees surveyed said the Summit met or exceeded their expectations, and 88 percent rated the Summit as "Excellent" or "Very Good", and 84% of attendees rated the Summit content as "Extremely helpful" or "Very helpful."